Dora Belle Hall was born in September 1908 at Otisco Twp., Ionia Co., MI. She was the daughter of Francis Hall and Cynthia Kilbourne. Dora Belle Hall died on 1 May 1998 at Davison, Genesee Co., MI, at age 89. 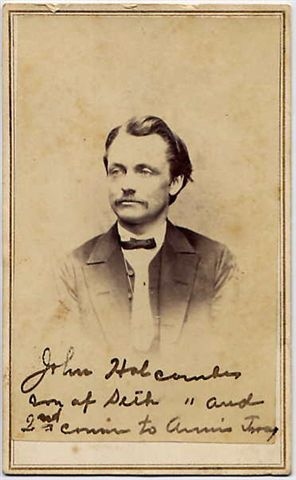 John Winslow Holcombe was born on 1 September 1836 at Newstead, Erie Co., NY. He was the son of Seth Holcombe and Lucy Ann Winslow. John Winslow Holcombe married Mary Margaret Bell circa 7 December 1876 at Brooklyn, NY. John Winslow Holcombe died on 28 August 1907 at Kent City, Kent Co., MI, at age 70. [S418] Ruth Cost Duncan, John Case 2nd Edition, page 152, item 452. [S418] Ruth Cost Duncan, John Case 2nd Edition, page 151, item 452. [S418] Ruth Cost Duncan, John Case 2nd Edition, page 152, item 452.i. [S418] Ruth Cost Duncan, John Case 2nd Edition, page 152, item 452.iv. F. C. Down married Dorothy Chappell, daughter of Rev. Robert Thomas Chappell and Martha Louisa Thomason. John Newell Holcombe was born on 31 July 1877 at Birmingham, Oakland Co., MI. He was the son of John Winslow Holcombe and Mary Margaret Bell. John Newell Holcombe married Edith LaVerne Smith on 26 June 1904. John Newell Holcombe died on 25 April 1939 at Kent City, Kent Co., MI, at age 61. William B. and Margaret were enumerated in the 1880 Prattsville Village, Prattsville Twp. Greene Co., NY, federal census, page 19. He was a grocer, age 35, she was 20. Beulah was also in the household. [S25] Hannah McPherson, Holcombe Genealogy, Page 61.2, Item A-4-5-2-3-5-7-10-1. [S25] Hannah McPherson, Holcombe Genealogy, Page 61.2, Item A-4-5-2-3-5-7-10-1-1. J. H. Caughn was a Union soldier and Episcopal minister of Geneva, NY. [S25] Hannah McPherson, Holcombe Genealogy, Page 61.2, Item A-4-5-2-3-5-7-10-2. [S25] Hannah McPherson, Holcombe Genealogy, Page 62.1, Item A-4-5-2-3-5-7-10-4. [S25] Hannah McPherson, Holcombe Genealogy, Page 62.1. [S25] Hannah McPherson, Holcombe Genealogy, Page 61.2, Item A-4-5-2-3-5-7-10-5. [S25] Hannah McPherson, Holcombe Genealogy, Page 61.2, Item A-4-5-2-3-5-7-10-6. Charles H. and Pearl were enumerated in the 1920 Prattsville, Greene Co., NY federal census, page 1A. Charles was a farmer age 53, Pearl was 42. Children in the household were Frences M. age 21, and Dorothea A. age 17. [S25] Hannah McPherson, Holcombe Genealogy, Page 61.2, Item A-4-5-2-3-5-7-10-8. Charles and Mahala were enumerated in the 1920 Prattsville, Greene Co., NY federal census page 3A. Children in the household were Leta M. age 15, Norman C. age 10, Naomi E. age 8, Marguerite M. age 5, and daughter Kathryn Brenn, a widow. Charles and Mahala were enumerated in the 1930 Prattsville, Greene Co., NY, federal census. He was 57, she was 57. Children in the household wre Kathryn Bishof a widow age 34, Norman C. 20, Marguerite 16, son-in-law Lawrence A. Parker 23, daughter Naomi E. 19, and grand-son William L. Parker, 1 month. [S25] Hannah McPherson, Holcombe Genealogy, Page 61.2, Item A-4-5-2-3-5-7-10-7. [S25] Hannah McPherson, Holcombe Genealogy, Page 61.2, Item A-4-5-2-3-5-7-10-9. William B. Frayer was born circa 1844 at NY.2 He was the son of Danforth M. Frayer and Permilla Kimble. William B. Frayer married Margaret Benham Holcombe, daughter of Norman Van Buren Holcombe and Mahala Phelps, on 1 January 1877.1 William B. Frayer died on 9 November 1884.1 He was buried at Lower Cemetery, Prattsville, Greene Co., NY. Humphrey and Beulah were enumerated in the 1920 Newburgh City, Orange Co., NY federal census, page 7B. Children in the household were Charlotte age 13, and Philip age 9. [S25] Hannah McPherson, Holcombe Genealogy, Page 61.2, Item A-4-5-2-3-5-7-10-1-2. Frederick T. and Rose were enumerated in the 1920 Prattsville, Greene Co., NY federal census, page 5A. Frederick was 32, Rose 33. Children in the household were Ada M. age 9, and Linden J. 8. Holcomb and Maud E. were enumerated in the 1920 Roxbury, Deleware Co., NY federal census, page 6A. He was a restaurant proprietor, age 31, she was 28. The only child in the household was Alice I. age 6. His parents Henry and Charlotte were also in the household, both working in the restaurant.